Congratulations on your engagement to be married! You have both taken a very big step by choosing to spend your entire life with each other. The Church supports your love for one another and seeks to support your married life through preparation for this very important Sacrament. This preparation will focus on your marriage to each other and also upon the Wedding Day. The following guidelines will help you prepare for a committed lifetime relationship with one another blessed in the Love of Jesus Christ through His Church. The celebration of the Sacrament of Marriage most rightly belongs to the Church. The staff of St. Paul Parish will assist you in any way possible and extend to you our warmest wishes and prayers at this time in your life. To attend Mass on all Sundays and holy days of obligation. To fast and abstain on the days appointed by the church. To confess our sins at least once a year in the case of serious sin. To receive Holy Communion during the Easter season. To contribute to the financial support of the Church. To love God and share God’s love with all with compassion and charity. 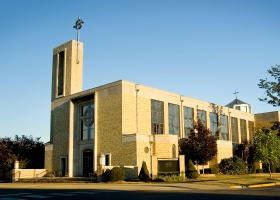 If you were a former parishioner, the pastor may allow your marriage to be held at St. Paul Church. You would be required to seek a letter from your pastor where you are presently registered and living your sacramental life. STEP 1: Contact Fr. Pat at [email protected] no later than 6 months before the proposed wedding date to set up a meeting. A Prenuptial Questionnaire will be completed at the initial meeting to assure the couple is free to marry. The date of your wedding will be booked on the parish calendar only after the initial interview. The couple must secure the date with the parish before making arrangements for the reception hall, caterers, etc. STEP 2: Complete FOCCUS (Facilitate Open, Caring Communication, Understanding and Study) Questionnaire. A one day or weekend Pre-Cana or Engaged Encounter Weekend is required. (For information see pages 13-16 in The Engaged Couple’s Guide in your packet.) Dates and costs for a Catholic Engaged Encounter can be found at: www.intermoxxmedia.com/wedding. Upcoming Pre Cana dates at St. Paul are: March 26, 2017 and September 24, 2017. Registration is done through the diocese. STEP 4: Plan your wedding Liturgy. ¨ Both parties, if baptized, need a current copy of their baptismal certificate from their church of baptism. For Catholics, a Confirmation notation should be included. ¨ A Civil Marriage License must be obtained before a church wedding may take place. It can be obtained at the Madison County Courthouse in Edwardsville up to 60 days before the wedding date. Any couples planning to be married at St. Paul church who have additional questions, please call the parish office at 654-2339.